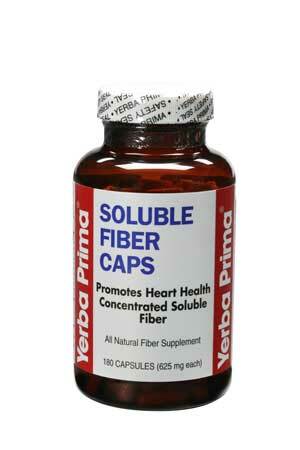 Soluble Fiber Caps is a simple, natural way to help promote heart health by supporting normal cholesterol levels. Soluble fiber has been shown in numerous studies to help remove excess cholesterol from the intestinal tract. Soluble Fiber Caps is a concentrated source of soluble fiber from multiple sources, including the two most proven sources of soluble fiber – psyllium husks and oat bran. Health authorities, including the Food & Drug Administration, recommend 25 to 35 grams daily of fiber for good health. Most Americans consume only 10 to 15 grams of fiber each day, less than half of the recommended amount. For improved health, it is beneficial to eat a variety of high fiber foods and take a fiber supplement as needed. For best results, use everyday as long as desired. Soluble Fiber Caps contains no added sweeteners, colors or additives. SUGGESTED USE: ADULTS AND CHILDREN OVER 12: To help maintain normal cholesterol levels and support heart health, take 5 capsules 3 times a day, with meals. As a fiber supplement, take 5 capsules 1 - 3 times a day, with meals. DIRECTIONS: Start by taking 1 serving each day. After several days, increase to 3 servings a day. Swallow one capsule at a time. Take each serving with at least 8 ounces (a full glass) of water or other liquid. Drinking additional liquid is helpful. If minor gas or bloating occurs, reduce the amount you take until your system adjusts. Ingredients: Psyllium seed husks, acacia gum, oat bran, apple fiber, apple pectin extract, USP Kosher gelatin capsule.